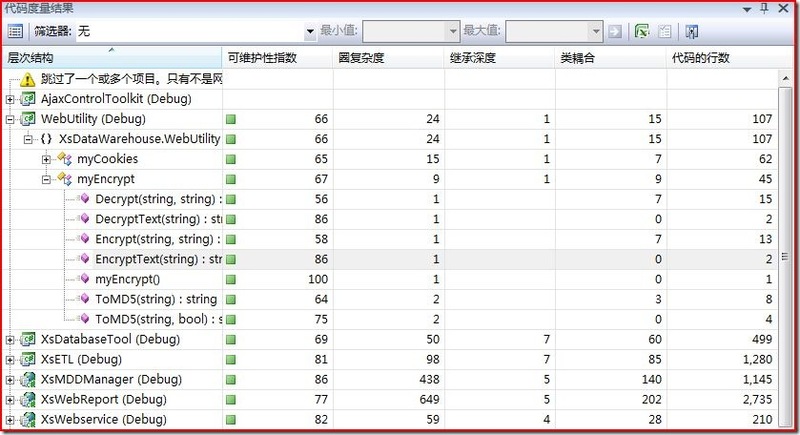 Visual Studio2008的新功能：代码度量 - IT咨询 - 煮酒论坛 - Powered by Discuz! While we've already briefly spoken about Code Metrics when we announced it, I thought I would discuss it in a little more depth, in particular the metrics it provides. As mentioned previously, Code Metrics is a new tool window that helps users find and act upon complex and un maintainable areas within an application. As you can see from above, for Visual Studio 2008, we're providing five metrics. These are detailed below. At each level, this indicates the total number of dependencies that the item has on other types. This number excludes primitive and built-in types such as Int32, String and Object. The higher this number, the more likely changes in other types will ripple though this item. A lower value at the type level can indicate candidates for possible reuse. For example, as you can see above, Account is coupled to two other types, Address and Order, whereas Country is not dependent on any other type. At the type level, depth of inheritance indicates the number of types that are above the type in the inheritance tree. For example, a type that derives directly from Object would have a depth of inheritance of 1. At the namespace and project level, this indicates the highest depth of inheritance of all the types contained within it. This number does not take into consideration the depth of any implemented interfaces. Deep inheritance trees can indicate an over-engineering of a problem and can increase the complexity of testing and maintaining an application. For example, in the above inheritance hierarchy, ListControl and Label have a depth of inheritance of 3, whereas Component has a depth of inheritance of 1. At each level, this measures the total number of individual paths through the code. This is basically calculated by counting the number of decision points (such as if blocks, switchcases, and do, while, foreachand forloops) and adding 1. This number is also a good indication on the number of unit tests it will take to achieve full line coverage. Lower is typically better. At each level, this is a measure of the total number of executable lines of code. This excludes white space, comments, braces and the declarations of members, types and namespaces themselves. Lower is typically better. 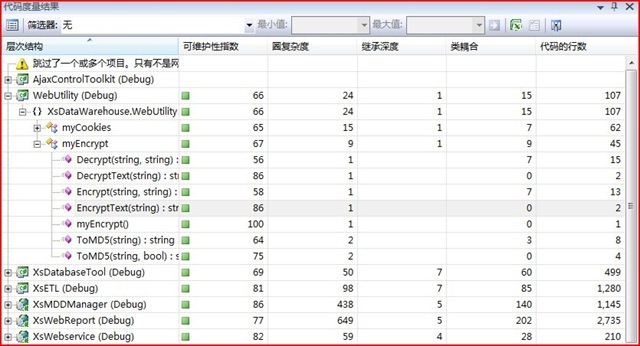 At the member and type level, this is an index from 0 to 100 indicating the overall maintainability of the member or type. At the namespace and assembly level, this is an average of the maintainability index of all types contained within it. This index is based on several other metrics, including Halstead Volume (which factors in the number and use of operands and operators), Cyclomatic Complexity and Lines of Code. A low number indicates code that is complex and hard to maintain. These icons allow you to see at a glance any trouble spots that you should start to focusing on or filling bugs against. Now that you know what these metrics measure, and how they are calculated, the next thing you'll want to know is what you should do when you start to see some red in your application. In a future post, I will cover why should should care about each metric, and how to go about fixing some of the common issues that cause particular metrics to high (or low in the case of Maintainability Index). GMT+8, 2019-4-24 16:04 , Processed in 0.025981 second(s), 17 queries .